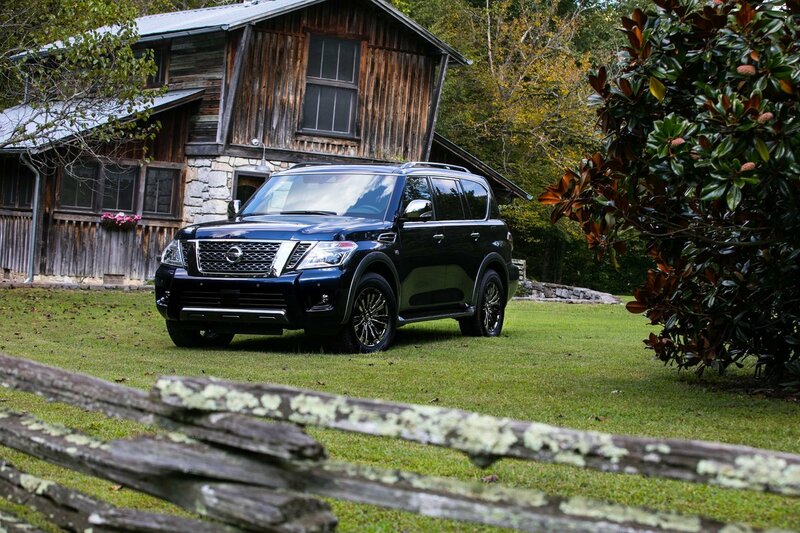 Nissan believes that there’s no reason you can’t be comfortable while hauling the entire family out to the lake, or across the country on a road trip and created the Armada Platinum Reserve to help you do so. The range-topping Armada trim level gives the vehicle even more presence than the standard Armada with 20″ alloy wheels and exterior trim finished in “Dark Chrome.” The interior of the Armada Platinum Reserve has exclusive two-tone waffle-stitched leather seats and a wood tone interior trim package. Now that Infiniti has moved their products upscale into the premium luxury segment, Nissan has stepped up the luxury finishes in their products. Call it what you will, but the Armada Platinum Reserve is definitely a premium product for premium buyers. 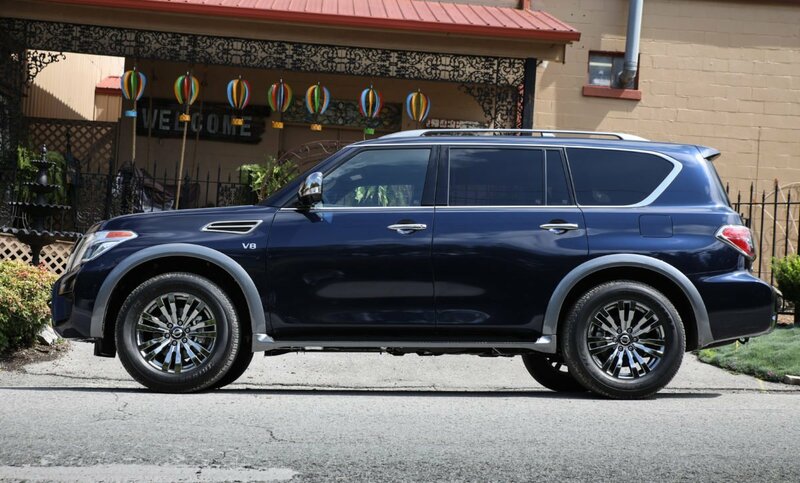 Make no mistake, the Armada Platinum Reserve is no Infiniti QX80 in terms of outright luxury, but that line between them is starting to get really blurry. The Nissan Armada sold in the United States is basically the well-respected off-roader known as the Nissan Patrol in the rest of the world. The Armada sits on a fully-boxed frame, which gives the Armada all the strength and rigidity you’d expect of a body-on-frame off-roader. 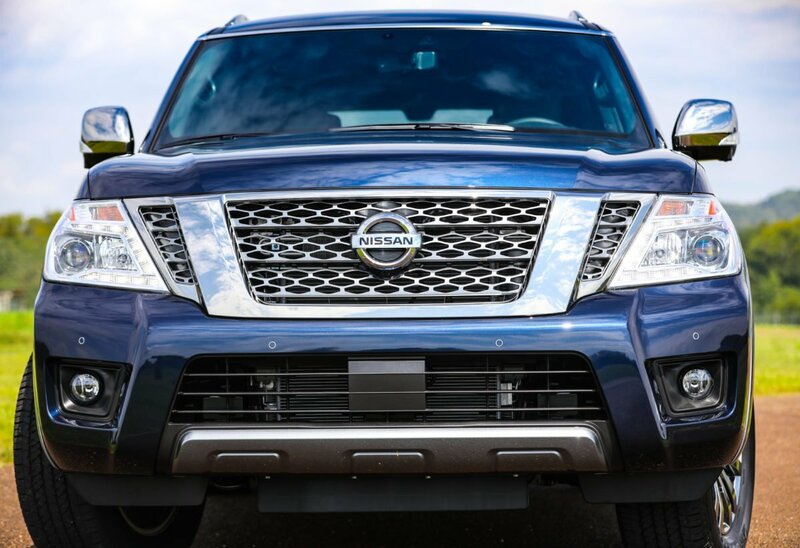 While this typically is a bad thing as far as ride comfort goes, Nissan engineered the Armada to be exceptionally comfortable in both ride and handling. The ride is actually pleasantly firm, but in an extremely refined manner. This is thanks to a fully-independent suspension all the way around. Bumps get soaked up with ease, and the Armada is surprisingly nimble when out on the road or navigating through tight parking garages. I will say that the Armada’s steering at low speeds felt a little under boosted for my tastes, and took some getting used to but was surprisingly easy to maneuver for its size. 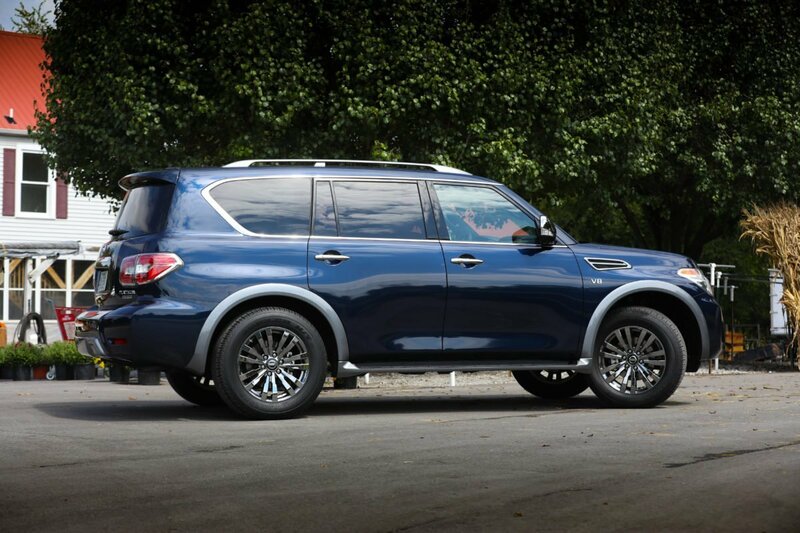 An SUV of this size can often times be called upon to tow, and the Armada delivers a 8,500 tow rating (in both 2WD and 4WD configurations) thanks to the 5.6-liter Endurance V8. The Nissan Endurance V8 makes 390 horsepower and 394 lb-ft of torque. Power gets to the wheels by way of a 7-speed automatic transmission. Thankfully, Nissan engineers haven’t neutered the beautiful exhaust note the Endurance V8 makes, and it’s easy to want to get on the go-pedal to hear it scream. The result is an observed fuel economy number that hovered in the lower to mid-teens. A little lighter foot could probably get you into the 18 mpg range, but this is a SPORT utility vehicle after all. The Armada Platinum Reserve pulls from Nissan’s cache of intelligent safety system and features a full suite of standard safety equipment including Intelligent Cruise Control, Automatic Emergency Braking, Intelligent Forward Collision Warning, and the new for 2019 Rear Door Alert. The Rear Door Alert is an industry first which uses door sensors to remind drivers to check the back seat for precious cargo after the vehicle gets parked. Also standard on the Armada Platinum Reserve is the Intelligent Rear View Mirror which displays the rear camera in the rear view mirror by way of an integrated LCD monitor. 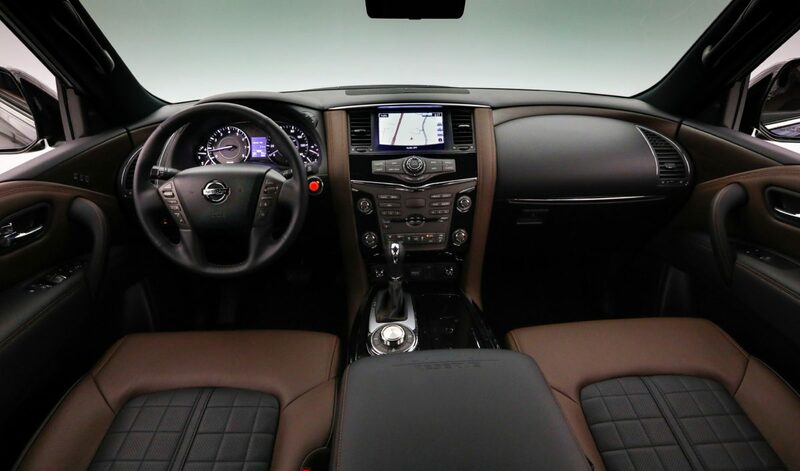 Other standard interior features on the Armada Platinum Reserve include a 13 speaker Bose audio system, navigation, NissanConnect, DVD entertainment system with dual 8.0-inch head rest mounted monitors, USB and HDMI ports, VTR jacks, wireless headphones, and a remote control. As one would expect in a vehicle in this class, the Armada comes with plenty of places to put everyone’s stuff as well. There are nine cupholders, four bottle holders, a cavernous front center console, and enough cargo space for just about anything a family would need to haul with them. The Nissan Armada Platinum Reserve is an extremely well equipped SUV and will appeal to buyers who are looking for comfort, safety features, as well as on and off-road capability. The Nissan Armada Platinum Reserve is a serious competitor to the ubiquitous Ford Expedition Platinum and Chevrolet Tahoe Premier, but dominates both in terms of value and road presence.